Forewords by Hema Malini & Dr. K.H. Sancheti Mindful Alignment for a Pain-Free Life Do you suffer from back, neck and shoulder pains? Are you unable to lose weight? Do you have a weak core and flabby muscles? Chances are you’ve been seeking expert advice, getting countless x-rays done, downing protein shakes and raising a mountain in medical and fitness bills. But the solution to your woes may lie in something as simple as your posture. Unbelievable? It is true! Posture is not just about sitting straight – it is intelligent awareness of your body’s framework and balance, and it can be used to banish the aches and pains associated with age and modern lifestyles. 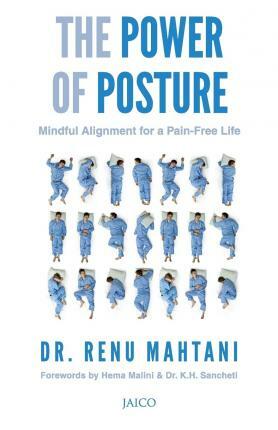 The Power of Posture is your one-stop guide to successfully resolving your body’s issues and replenish your health and vitality. Here you will find: ● answers to weight loss issues ● ways to boost flexibility and metabolism ● corrections for muscle imbalance from over-exercising ● solutions to aching neck, shoulders and back ● the key to pain-free legs and knee joints …and much more. With Yoga and Pilates therapies and more than 100 images to show postures and techniques, you will only wish you had known the Power of Posture earlier. Dr. Renu Mahtani, MD, is a practicing physician who runs the Param Yoga centre (www.paramyoga.in ) in Pune. Her holistic approach towards health and lifestyle incorporates customised breath therapy, yoga and pilate techniques, not just for aches and pains but also for chronic diseases, low immune conditions, anxiety and depression.